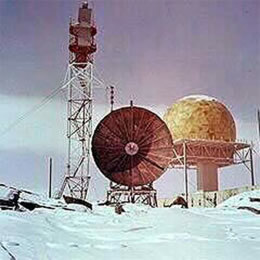 On the 15 February 1954 United States President Eisenhower signed legislation allowing for the construction of the Distant Early Warning Line (DEW Line), a network of 58 radar and communication sites stretching 5000 kilometres across the top of the North American continent from Alaska to Greenland. The DEW Line was a product of the Cold War and was designed to give the American and Canadian military early warning of a Soviet bomber or missile attack ‘over the Pole’.An estimated 25,000 people were involved in the planning and building of the DEW Line. It took 460,000 tons of material, moved by air, land and water from the United States and Canada to the Arctic, to complete the DEW Line on schedule July 31, 1957. Along with radar domes and communication towers “each station has its own electricity, water service, heating facilities, homes, work buildings, recreation areas and roads”, in many respects each was a complete, though very isolated, community built on the Arctic coast. Though the vast majority of those employed during the construction phase were from the south a report issued in 1958 by Western Electric Corporation, the main construction contractor, praised the few Inuit who were employed. The report stated, “the native Eskimos provided their share of workers on the Line, too. Although baffled at first by modern machines and construction methods, they were quick to catch on. Whether driving dog teams or bulldozers, they proved conscientious and dependable.”In 1985 the DEW Line began its upgrade and transition to become the North Warning System (NWS) of today.